Japanese honeysuckle (Lonicera japonica var. Sinensis): growing, planting, caring. A species of climbing honeysuckle, with red and white flowers. Full description for Lonicera japonica var. Sinensis not yet available. Honeysuckle is a climbing shrub — or a creeper! — which produces both red berries and flowers well known for their fragrance in spring. There are over 200 varieties of honeysuckle, both perenial and decidious varieties. Wild honeysuckle loves climbing up trees. Like other creeping plants, honeysuckle is a choice habitat of birds, and helps certain insects and small mammels to move around trees. Honeysuckle may be cultivated in most climates and especially enjoys sunny, mildly warm regions. It's also easy to cultivate in a pot! Look into having a support for it to cling to and unwind, that is if you've chosen a creeping varietal or a shrub. Like clematis, honeysuckle likes to have it's head in full sun and it's base in the shade to keep the soil cool. However, it can adapt perfectly to a partially shaded location. Growing on the edge of forests in it's natural habitit, honeysuckle require cool eart, even in summer. Plant ideally in autumn, or up until spring, but in either case make sure to avoid freezing temperatures or extreme heat. Dig a hole twice the height and width of the root ball. Run a trowel gently around the root ball to separate and aerate the roots that remained stuck to the pot. Place the root ball in the hole so that the collar - the base of the plant - is raised a few centimeters above the ground. Fill the hole with a mixture of potting soil and garden soil. Then water generously and lightly pack down the soil. 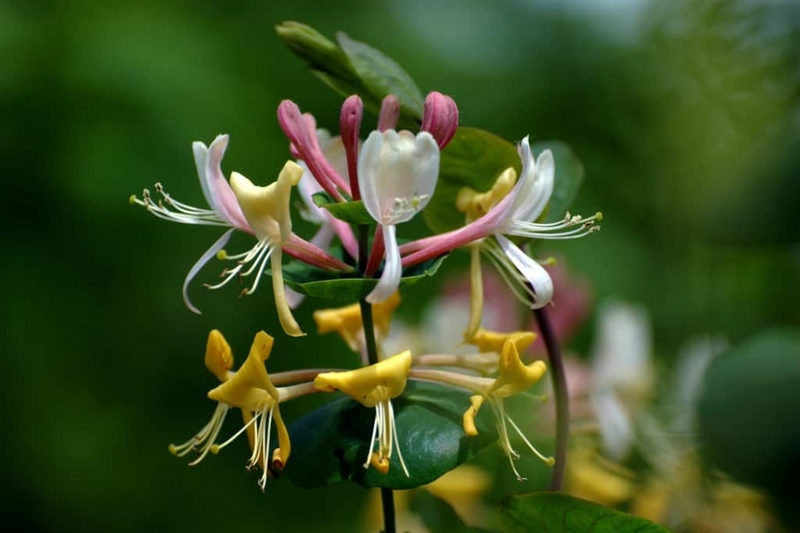 Your honeysuckle is an undergrowth plant — it loves loose, cool soil. Give it a good mulching at the beginning of the saison, and don't be afraid to lay it on thick - especially if it's growing in a pot! Honeysuckle needs cool soil, especially in the summer, but it actually doesn't have great need of water. Long periods of dryness do worry it though, especially if it's in a pot. If in a pot, keep an eye on it, and don't let the substrate dry out between two waterings, especially the first few weeks after planting. If planted directly in soil, after the first few weeks of regular watering — especially if you choose to plant in spring — you won't need to worry about it except in the hotness and driest conditions. This variety fears harsh winters, so if it is in pots, shelter it before winter. Put it out when sunny days come back. After the last frost, bring out your Japanese honeysuckle in pots, without placing it directly in direct sunlight. No pruning is really necessary for climbing honeysuckle. In case you want to operate a shaping trim to rebalance its antlers, wait until the end of flowering. If your honeysuckle begins to thin, it is also possible to perform a severe pruning in late winter, it will boost its growth! Honeysuckle appears quite rustic once it's settled itself in well. Nonethe less, it may fall victim to a fungus, powdery mildew, which is characterized by a white or grew coating on the leaves. Honeysuckle can also be invaded by aphids — leaves shrivel and die, and if you turn over a dead leaf you'll see the brown and green parasites! At the first sign of an attack, grab your baking soda! Because of it's basic pH, sodium bicarbonate prevents the formation of fungal spores. Dilute one or two tablespoons of sodium bicarbonate in a litre of water and add one tablespoon of liquid dish soap or milk — this will allow the solution to stick to the leaves. Spray this solution on and under the leaves, and re-apply after heavy rain.